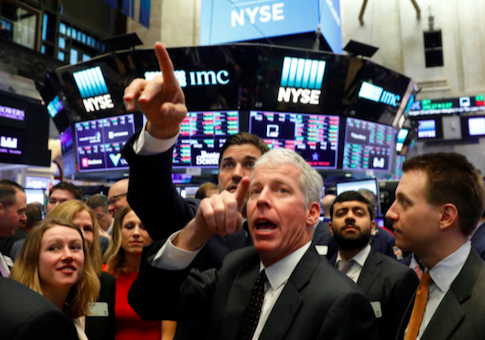 (Reuters) — Wall Street's main indexes rose sharply on Tuesday, with the Dow hitting the 26,000 mark for the first time, as the fourth-quarter earnings season kicked into high gear. UnitedHealth rose 2.2 percent after the largest U.S. health insurer reported results that beat analysts' estimates and raised its full-year profit forecast. "Not only is the U.S. coming off a strong quarter, but the new tax reform measures are continuing to provide a boost, with investors keen to hear more about what impact this will have on futureearnings," said Craig Erlam, senior market analyst at online foreign exchange broker Oanda. At 9:41 a.m. ET, the Dow Jones Industrial Average was up 225.34 points, or 0.87 percent, at 26,028.53, helping it record its fastest 1000-point rise. It ended above 25,000 on Jan. 4. General Electric shares fell 3.7 percent after the industrial conglomerate said it would record a $6.2 billion charge in the fourth quarter as part of an ongoing review of its finance arm's insurance portfolio. Nine of the 11 major S&P sectors were higher, led by a 1.44 percent rise in the real estate index and 0.92 percent gains in the technology index <>SPLRCT>. This entry was posted in Issues and tagged Economy, Stock Market. Bookmark the permalink.